My heart goes out to the family of the late former Vice President Lupando Mwape. This is a difficult time for the family and close friends of the late servant of the people. May the Lord our God strengthen us all as we reflect on this wonderful life. 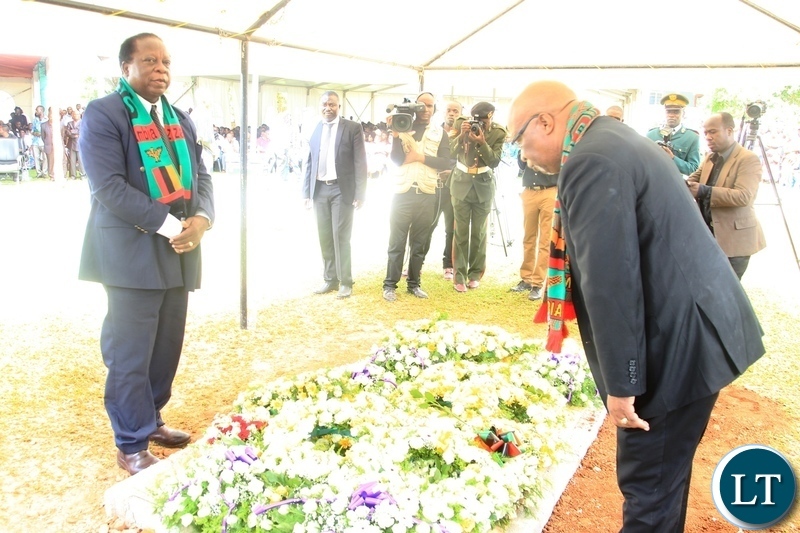 At the height of his public service he remains as one of the few Vice Presidents who acted as president for a prolonged period of time when the late President Levy Mwanawasa was hospitalized in London. It was therefore befitting for the government to have evacuated him to South Africa for specialized treatment. We commend government for the gesture. Without disturbing the spirit of mourning, I wish to raise a pivotal issue which relates to the plight of former Vice Presidents in Zambia. Although Vice Presidents actually act as President and play a significant role in the management of the the nation, the occupants of that office have zero sustainable benefits once they leave office. The only sure retirement benefit has been a state funeral at death. Hon Lupando’s death becomes an opportunity to raise this matter in the hope that government can ensure that those who serve the nation faithfully are taken care of after leaving office. Former Presidents, the Chief Justice, the Speaker of the National Assembly, Service Chiefs and civil servants have packages once they retire but a former Vice President has none. I however need to place a disclaimer that I do not raise this matter to benefit myself having held this office but to highlight a matter that has embarrassed Zambia for years both at home and abroad. In most nations, a Vice President leaves office with sustainable benefits. In Zambia they leave office with debt arising from whatever loan they could have contracted. Everything is withdrawn, the security, staff, vehicles, diplomatic passport and are thrown onto the streets with no monthly stipend to help in paying off the loan they could have contracted while in office. Those of us who knew and walked with the late Lupando Mwape remain heart broken by the life he was subjected to. His case must raise a moral debate as to why a man who did not even have a place to lay his head should be given an expensive state funeral. In life, he suffered from lack, in death, he is treated as a king. This is not to belittle the honor of the state funeral but to challenge cabinet office as to the morality of this status quo. This problem of the nation’s number two comes from the UNIP days. Vice Presidents Simon Mwansa Kapwepwe, Secretary General of UNIP, Grey Zulu, Prime Ministers Malimba Masheke, Kebby Musokotwane, Nalumino Mundia, Mainza Chona. I believe as MMD we failed to secure these freedom fighters financially to give them a dignified life. Some have gone to the grave in great poverty. I am reminded of the immeasurable hardships the late former Vice President Gen Christon Tembo went through in trying to pay for medical bills, until we lost him. He was however given an elaborate state funeral. As MMD, we approved former Presidents’ package but left out those who labored side by side with them. I hope the PF can see the value of correcting this national anomaly. Sir, you should think of also those retirees who die without getting their pension money. Lupando , christon tembo and yourself I am sure got your gratuity. But the old men and women keep queuing for their meagre pension which has not been paid. The late Lupando Mwape should have got his gratuity from Parliament. He also walked away with a duty free prado or a VX. Equally he should have been getting huge allowances for this travel and that travel. It is about how he invested his money. I am still waiting for my pension money. If you guys take to read what Nevers is saying, the man got valid points on retired senior citizens. Ba Mumba you are just broke my brother!! If you do not want state funeral be like you uncle the late Kapwepwe. The choice is yours. Tukamishika mu butanda. Politics should be for rich people; that way they go in with the spirit of service. Inonge Wina, Guy Scott, Inoch Kavindele will not cry for help because they are all financially stable. Makes sense for VP to have benefits now that he’s not appointed, is a running mate. That’s the debate we should have. Sad constitution was signed in a hurry by a blind man. With all due respect Sir, now that you probably will be subjected to the same treatment, how about putting all these wrongs in your party’s agenda and make govt change them for the benefit of every Zambian? Use Parliament and not the Media. Social security should be enjoyed by each and every Zambian…. There is honesty in this and truthfully, men like Lupando, dignified public servants live in poverty after retirement. This is not right and should indeed be corrected. For anything that someone can fault Nevers on, even in his criticism, he remains respectful, I have never heard of him berating President Lungu with derogatory remarks. Dr.Mumba, all the VPs you have mentioned WERE MERE POLITICIANS, ELECTED MPs or NOMINATED! However, we have an exception for the ELECTED VP as we now have in the current constitution where Mama Inonge Wina can be said to have been elected and deserves a package at the end of her term. I would support that because even a Speaker if not re-elected by the MPs in a new Parliament ceases to be and gets a package. WE CAN EXTEND THAT TO A VP,BUT NOT AN EXTRAVAGANT PACKAGE LIKE BUILDING HOUSES etc..may be just a basic pay, state sponsored medical expenses. Nevers Mumba is right especially that now the constitution provides for an ELECTED vice president who is running mate to the president. Why should one be on life pension while the other is left out when both stood on the same ticket? Not what the state should do for you but what you should do for the state and yourself! We Africans need to do ourselves a favour: Treat everything the white man taught you as a big white lie! We had no beggars in Africa until the white man came. Africans were self-sufficient! Former Vice Presidents should equally learn to be self-sufficient! Make hay while there is still sun shine! Many Zambians are dying poor because they have been made to believe that heaven is for poor people! Adam and Eve were made to be fruitful (Productive) before multiplying (Bearing children), to have dominion and to replenish the earth and the first job God gave them was Agriculture! If you want to be poor and sick, ignore Agriculture! If you want to be poor, multiply first before being fruitful then you will be locked up in a vicious cycle of poverty, disease and hunger and your only opioid will be religion and wishful thinking! The first thing I did to realize riches was by taking a break from church for one year to reflect on God’s purpose for my life! It was shocking how hostile the church became towards me but I persevered until I found out my purpose and how the church was teaching me lies about wealth (not just money) and Salvation! Diligent hands bring wealth but lazy hands only lead to more lack and your want overpowers you like an armed bandit! Those of you who are stuck in town, make a bold decision and go back to the land! We need to replenish the rural areas with development! Nevers Mumba raises good points. That’s just absurd like having the head of Volvo trucks division getting more benefits than the overall Senior VP who assists the Volvo CEO in running the whole enterprise. Very correct – but this was not important to Mumba when he was VP, right? Only a shallow minded person can fail to understand the reasons advanced by Dr Mumba. Whether appointed or not previously, the Vice Presidency is the second highest office in the land and should therefore should be treated with some dignity. Moreover the Chief Justice, service chiefs and speaker are equally appointed but still taken care of by the state after they leave office. Why should A former Vice President of a country be seen to be lacking after they leave office? Twilaisebanya nainwe. Let’s not be petty and jealous. Those fellows had huge salaries if they squand it is their business to live in poverty. Some of us never had chance of being employed like Mr. Mumba. How can a vice president cry like that maybe his he was not even worth to be vice president in the first place. If his bidding is done wondering what be left of treasury. Manage yourself properly. He should have done this when he was still vice president. Dr. Mumba, your lamentations are well understood. However the Govt casts a blind eye if they see that in your retirement you continue to be in active opposition politics and castigating them all the time. Retire in a humble manner and try to support the institution that you once served i.e. Vice Presidency, then some consideration will surely be shown. The truth of the matter is when you fight the institution then you will be fought back with all might. HUMBLE YOURSELF AND SEE WHAT LUNGU WILL DO. Chabipa ba Mumba… No govt salary, No more crumbs from HH, and not enough umutulo ku church.!! Politics shall eventually be the only beneficial occupation where you are well looked after now, then and forever when you rise to President level. No wonder everyone wants to be the President. Whatever happened to buyer beware? Isn’t veep a voluntary role that you can accept or decline? So if you don’t want to retire destitute and the people come calling, what do you do? Thanks but no thanks. I’ll serve my country another way. i agree with my friend here no way ,you are in politic and you want the govt to help you a big no………lets help the poor in this country . No monthly stipend to help in paying off the loan they could have contracted while in office, If you get a loan use it wisely. It’s not tax payers issue to pay your loan. Meanwhile it’s Snowing here in London Mushota. There should be no retirement packages for the president and vice president. MPs and Minister’s included. Both should be part of the civil service pension fund and wait for their payouts like everyone else. Talk about social welfare for the common man before you think of lining the pockets of the privileged including yourself. You should not go into politics to make a buck but to serve. You certainly have read the Bible and you should understand this.